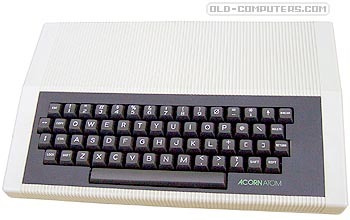 The Acorn Atom was the ancestor of the BBC computers series. It was sold in kit or ready-assembled versions. The great advantage of the Atom compared to its competitors (TRS-80 & PET), was its high resolution capabilities (256 x 192) which were quite unusual in 1979 for the price. The built-in BASIC was in some ways quite limited (it could only use integers for example) but an optional 4K ROM added the ability to use floating point numbers, trigonometric functions, to convert degrees/radians and to draw graphics in color. More add-ons were also available enabling autonumbering, a faster cassette interface (1200 bauds), and functions such as INKEY$, MID$, READ, DATA, FILL, etc... There was even a BBC BASIC board available. A lot of applications were available on sideways ROMs that plugged into the "utility ROM socket" as Acorn called it, such as the "Atom Word Pack ROM" (word processing) or Atom-Calc (a 4K ROM spreadsheet). A colour card was available, connected to the BUS connector, it provided 8 colors, 4 simultaneously at the 64 x 192 resolution or 2 at 128 x 192 for example. But it was known to overheat! The overheating of the graphics card seemed due to the conversion from NTSC to PAL. THE VC chip could be just seen under the mountain of discrete components to convert the scan rate... Programming the atom was fun, allowing the mixing of in-line assembler code embedded in basic programs. This made the transition from high level to assembler programming easier. My father bought one and had 2 subsequent replacements supplied FOC by Acorn due to problems in the video circuitry (mostly the output frequency wandering). The speaker was not just a beeper. You have direct write access to the I/O port, and it could be made to beep at a particular pitch by 'toggling' the speaker at a particular frequency. I used to use a one-liner that I would type in manually at night to wake me up with a warble at a desired time in the morning! see more Acorn Computer ATOM Ebay auctions !